For a masterpiece in indulgent rug fashion look no further than the Mr Grey. 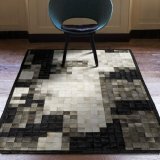 Not to be mistaken as a reservoir dog that made the cutting room floor, this pixel-esque rug takes a huge side step from Plantation Rugs normal 100% wool offerings and utilises the best of cow hair and leather to create this truly unforgettable rug. The curiously padded leather patches provide a three dimensional feel. The white and blacks entwine to create an air of mystery and intrigue.